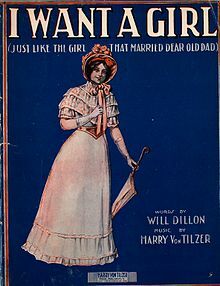 Want A Girl (Just Like The Girl That Married Dear Old Dad) (sometimes shortened to “I Want A Girl”) is a popular song of 1911 composed by Harry Von Tilzer and with lyrics by William Dillon, which has become a barbershop quartet standard. Von Tilzer and Dillon had never written a song together before, but finding themselves on the same vaudeville bill, von Tilzer suggested they might collaborate on some songs while on the road. 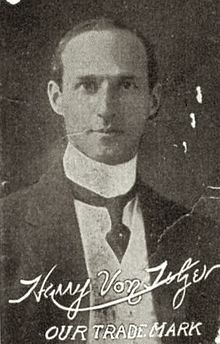 Dillon had already had some success with “girl” songs such as “I’d Rather Have a Girlie Than an Automobile”, so von Tilzer suggested they try another in that vein. The song came together in February 1911, and was published on March 11, 1911. While singers immediately took to it, Dillon and von Tilzer did not use it much themselves. Yet, the song was one of the most popular of 1911, bested only by Alexander’s Ragtime Band by Irving Berlin. According to Dillon’s 1966 obituary in The New York Times, the song sold over five million score sheets and recordings.Among many subsequent appearances in pop culture, the song appears in the 1944 film Show Business, the 1946 film The Jolson Story, the Outlast DLC Whistleblower, and an episode of the 1980s cartoon DuckTales.Since the song refers to a young man wanting to find a wife like his mother, it is perhaps inevitable that some commentators have suggested, with varying degrees of seriousness, that the song’s title and lyrics promote an Oedipus complex. July 1, 2018, 2pm. About Me. I should be at Times Square, 46th Street, ready to make an important message from me announcement to theatergoers on line to see Mormon Church of Satan’s Hamilton musical and Donna Summers musical, but I’m not. I’m sitting here in my room, at my computer—I am feeling too depressed to go out, and even more depressed because I feel that, even though I feel depressed, I should not allow depression to prevent me from doing my work. I have in the past written that, Jehovah God’s holy spirit drives me on, no matter how much physical pain or emotional torment I feel. And obviously my announcement—about Caroline Kennedy, President, 2020!—is pure nonsense. Right now, 2:02pm, sirens are blaring outside, two or three people are talking in the kitchen or in the bathroom, easy button laser beam pain began paining my head. Last night I woke up at least seven maybe eight times, feeling easy button laser beam pressure on my bladder, and easy button laser beam perspiration dripping from my face. Today, off and on all day, easy button laser beam tinnitus precedes easy button laser beam dripping perspiration attacks, sometimes accompanied by sirens blaring outside, one or two times, amplified thumps next door. Before each easy button laser beam perspiration attack, there is silence, then, easy button laser beam tinnitus begins ringing in my ears and then easy button laser beam beds of perspiration begin forming on my face, and sometimes my entire upper body. Sometimes the easy button laser beam perspiration feels like something is crawling on my face or my entire upper body. The time is now 2:12pm. My entire upper body is dripping perspiration, easy button laser beam perspiration, and easy button laser beam tinnitus ringing loudly in my head; several amplified thumps next door; amplified toilet flush in bathroom. I am suffering physically, mentally, and emotionally. I did not know, until today, about the mistaken identity murder in the Bronx. My grandson Wesley lives in the Bronx. Quite a bit of news coming out of the Bronx these past few days: the bad news about the mistaken identity brutal murder, and the “good news” about the new star of the Democratic Party, the new leader of the left. I have no complaint against her personally, she who will be one of the puppets for Mormon Danettes/Danettes. My grandson Wesley now lives in the Bronx. He was conceived in Atlanta, Georgia. Wesley’s mom, my youngest daughter who has asked me to not mention her name or anything about her, met Wesley’s father, when she was employed at Krogers in Atlanta, Georgia. She worked as a cashier in the checkout department; he was an employee in the produce department. Wesley does not know his father. I am glad my daughter decided to not have an abortion. Before she moved to Atlanta, Georgia, Wesley’s mom was a student at Howard University, in Washington DC. She was also accepted at Drew University, and I was very disappointed when she chose to move to Washington DC rather than stay closer to home, in Madison, New Jersey. (I do not know if that’s the reason she later named one of my granddaughters the middle name Madison.) She later graduated from Fordham University; coincidentally the year she graduated is the year Fordham graduation ceremony was held at crowded—overly crowded!—City Center or wherever it was that was at that time Alvin Ailey Dance Company home base. My oldest granddaughter’s name is Zoe. I do not know who suggested to my daughter, the name Zoe. My daughter did not know that, Zoe was one of my pen names when I first began distributing information; my granddaughter Zoe is a “special needs” child. When my youngest daughter and her first husband and my grandson Wesley moved to Jersey City, New Jersey from Columbus, Ohio, they rented an apartment on Kennedy Boulevard in the same block as the Kennedy Dance School that she attended as a child. It might have been the same building. She later moved to Newkirk Street, the street where Mr. Saunders law office was located (I was employed as a file clerk in Mr. Saunders office when I was in high school), and then to Claremont Avenue between Ocean Avenue and Rose Avenue (I lived on Claremont Avenue between Kennedy Boulevard and West Side Avenue) and then to Kearny Avenue (at Yale Avenue which is where her father lived) and then she rented an apartment on Lexington Avenue, and a few years later, another apartment on Lexington Avenue. It was while she lived on Lexington Avenue that I read in the Jersey Journal about a new street gang was formed: the Lex Mob street gang. Wesley was not a member of the Mormon CIA’s Lex Mob street gang. [black female] KENTUCKY KINGDOM and HURRICAN BAY [black boy] Just down the road in Louisville! Kroger … Limited time – SHOP NOW! On January 25, 2018, Bravo announced its renewal for Season 16 of Top Chef. The new season will be filmed in Kentucky, including Louisville, Lexington, and Lake Cumberland. Life After Top Chef is a spin-off featuring former Top Chef contestants Richard Blais, Jennifer Carroll, Spike Mendelsohn, and Fabio Viviani, which focuses on various aspects of their lives, from managing and opening a restaurant to dealing with family dynamics and personal issues. It premiered on October 3, 2012. PUBLIC NOTICE: The Mormon church is not the church of Jesus Christ. The Mormon church’s Jesus Christ is an imposter, Satan in disguise! The Mormon Church of Satan is the number one enemy of Jesus Christ. For the American chef, see Jennifer Carroll (chef). For the Canadian swimmer, see Jennifer Carroll (swimmer). Jennifer Sandra Carroll (née Johnson; born August 27, 1959) is a Trinidadian-born American politician who was the 18th Lieutenant Governor of the U.S. state of Florida. The first black American and the first woman elected to the position, she assumed the office on January 4, 2011. On November 21, 2018, following President Donald Trump nomination Jennifer was sworn in as Commissioner of the American Battle Monuments Commission for a term expiring August 25, 2024. Although cleared later, Carroll came under scrutiny for public relations work for a charity that involved itself in gambling and for $24,000 in income she failed to report on financial disclosure forms and her federal taxes that was a bookkeeper’s oversight she fixed during the investigation. She resigned her post as lieutenant governor on March 12, 2013, at the request of Governor Rick Scott. The Florida Department of Law Enforcement subsequently concluded that she did not break any laws. The Reconstruction era was the period from 1863 (the Presidential Proclamation of December 8, 1863) to 1877. In the context of the American history, the term has two applications: the first applies to the complete history of the entire country from 1865 to 1877 following the American Civil War; the second, to the attempted transformation of the 11 ex-Confederate states from 1863 to 1877, as directed by Congress. Reconstruction ended the remnants of Confederate nationalism and of slavery, making the newly free slaves citizens with civil rights apparently guaranteed by three new Constitutional amendments. Three visions of Civil War memory appeared during Reconstruction: the reconciliationist vision, which was rooted in coping with the death and devastation the war had brought; the white supremacist vision, which included terror and violence; and the emancipationist vision, which sought full freedom, citizenship, and Constitutional equality for African Americans. Its flagship brands include Victoria’s Secret and Bath & Body Works. L Brands posted $10.5 billion in revenue in 2013, and was listed as #258 in the 2013 Fortune 500 list of top companies. Bella Cabakoff was born in Williamsburg, Brooklyn and moved to Columbus as a toddler. At age 21, she became the youngest buyer for the Lazarus department store chain. After spending over 20 years working for Lazarus, in 1951 she and her husband Harry Wexner opened a women’s clothing store named Leslie’s (after their son) on State Street. This store became the training ground for Leslie “Les” Wexner. In 1963, he borrowed $5,000 from his aunt and $5,000 from the bank and opened a store at the Kingsdale Shopping Center in Upper Arlington, Ohio. This store was named “The Limited” because the store focused on clothing for younger women, unlike his parents’ general merchandise store. Later in 1964, Bella and Harry closed their store to join their son in his venture.